saved, a photo by jahansell on Flickr. Our little kitten, Duchess, LOVES to go outside. She will back up from the door about 20 feet and hurl herself into it full-speed to open it and sneak out. One night she didn't come back. I went out every few hours, all night long, calling her, and a few times we thought we heard her cry. But it wasn't until morning that I finally found her, 30 feet up a tree. She refused to climb down and we don't own a ladder that tall. Finally I had a brilliant idea. I took this basket, tied one end of a string around the handle and the other end around a large stick. I hurled the stick over the branch and hoisted the basket up to where she was. 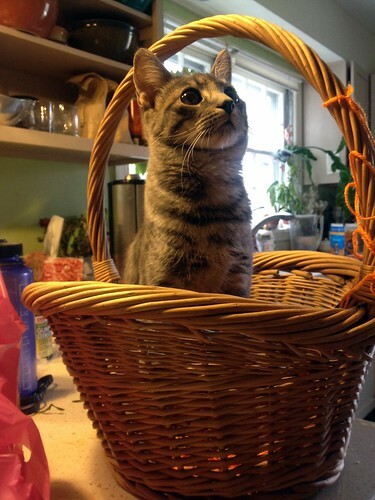 Amazingly, she climbed into the unstable, tipsy basket and we lowered her down. I failed to catch an action shot, but we memorialized the moment later.